The word “finally” is engraved on the back of the gold medal Andrew Haley won in the 100-metre butterfly at the 1998 world championships. It’s a reminder of the dedication Haley showed after attending his first Para-swimming worlds in 1990. “On the plane ride home back in 1990 I said to myself that one day I would be world champion. I had to wait eight years for the moment and it was worth it,” said Haley. “That was a pretty big thrill from an individual perspective. When Haley attended his first Paralympics in 1992 in Barcelona he had to pay for his own plane ticket and the Olympic ring he wears on his right hand. 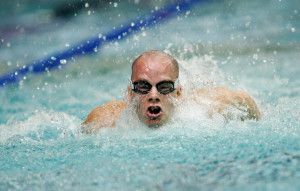 Four years later, after Swimming Canada took over the program, all his costs were covered for the Atlanta Paralympics. The gold medal Haley won at the 1994 Commonwealth Games in Victoria was also special because it was the first time athletes with a disability were included with able-bodied athletes. It also was an indication of the growth of Paralympic sports and was broadcast live on TV. His accomplishments also include setting the 100-m butterfly world record at a national championship meet in Victoria in 2002. Haley was six years old when he was diagnosed with bone cancer while living in Nova Scotia and his right leg was amputated above the knee. The cancer spread to one of his lungs, resulting in part of his lung also being removed. Haley, a sales executive for the Toronto Blue Jays, enjoys speaking engagements where he describes how his athletic success benefitted him in the business world. Being included in the Circle of Excellence with the country’s other great swimmers is an honour for Haley.